General Hospital Recap: Tom's Killer Unmasked--You Won't Believe It! Seth has some surprises, and Valntin sheds some guises in the “General Hospital” recap. Our “General Hospital” recap for January 30th-February 3rd tells of an explosive week of twists, turns, terror, and tenderness. Pull up a chair and catch up! Nina learns about Valentin’s past. Sam learns Jason is in the hosppital, they make a plan. Seth makes a confession to Liz, and Franco faces off with Seth. A confrontation between Nina and Anna ends with both learning something new. Finally–some clues to Nelle’s past, as Bobbie and Felicia hatch a plan to try to get info on her. Alexis catches Liv with Julian. Franco and Liz have make love. Kiki (Hayley Erin) begs Nathan (Ryan Paevey) to go to the storage house to help Franco (Roger Howarth) and Sam (Kelly Monaco). Meanwhile, Dante (Dominic Zamprogna) interviews Alexis (Nany Lee Grahn). She confesses to killing Tom. Diane (Carolyn Hennessy) barges in ands tries to stop this. Alexis, though, continues spilling her guts and goes into detail about her blackouts and then about Tom coming after her and fighting him off with a knife. She can’t remember killing him and didn’t have any blood on her clothes. He orders a search warrant for her house and shows her a picture of the murder scene. She remembers fighting Tom off, then dropping the knife and walking away. Dante thinks she’s innocent and assumes Franco did it. Dante tells Alexis that forensics has cleared her as a suspect. 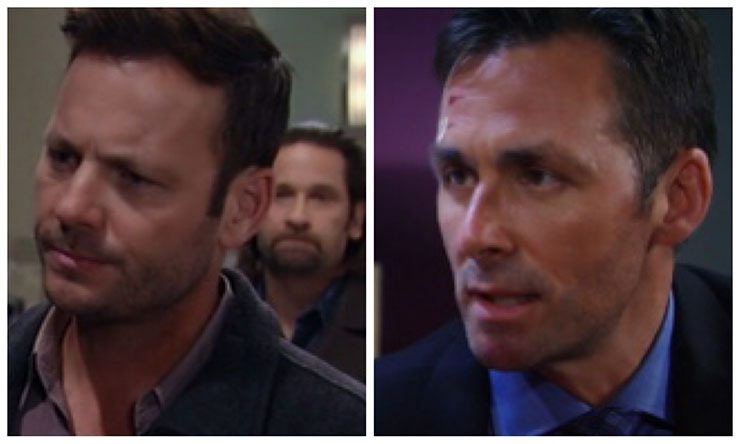 Dante leaves and runs into Julian (William deVry), who is there at his request to answer questions about Franco’s kidnapping. Julian swears he had nothing to do with it. Alexis and Diane walk out of the interrogation room, and Julian asks her if she confessed. Alexis fills Julian in on what has happened. While she didn’t kill Tom, she did run Julian down, she intends to confess to that. Julian won’t let her throw her life away and says she deserves a fresh start. Later, Alexis tells Diane that she wants to tell the bar that she’s not ready to get her license back just yet. Diane can’t believe her and storms off. Julian tells Alexis that he’s proud of her and will be here to help her. Andre (Anthony Montgomery) walks in on Jordan (Vinessa Antoine) while she’s on the phone trying to convince the new DA that Sonny (Maurice Benard) is innocent, but the woman hangs up on her. Jordan tells Andre she has something to tell him, but Andre interrupts her before she can speak. Andre apologizes for once again being selfish and giving her a hard time for leaving the wedding. She apologizes if she made him feel she hasn’t been choosing him. Curtis (Donnel Turner) interrupts them, so Andre decides to leave them and go work. Curtis hopes he proved himself to Jordan so that he can get his badge back. However, Jordan refuses to hire him and says he’ll need to find another department to work for. Curtis accuses her of wanting him to leave town so he doesn’t end up in her bed. Jordan slaps him. He promises her that he’s not leaving town no matter what. Franco explains to Sam that he ran into Alexis at the bar where Tom Baker was killed, he also mentions the photo he found of her with him. He insists that he wouldn’t have taken it to the police. He says Alexis must have had a purpose for killing Tom. Nathan arrives with other cops. Liz and Seth debate about who killed his brother. He doesn’t see how Liz can trust Franco. They argue about whether Tom could have been reformed. When he wanders off, she finds a photo album full of images of her and Alexis. Seth catches her. He claims he’s never seen it before so they assume it was Tom’s. There must be a clue in there, to point the police in the right direction. But refuses to let her leave with evidence against Tom. While upset he admits that once he saw the album he knew his brother wasn’t reformed, and he found him attacking a woman. Seth admits to stabbing Tom, then beating Franco up and locking him in his storage unit. Seth says Tom has destroyed him like he destroyed Liz, but Liz says they can overcame it. She begs him to let her call the police. Suddenly Franco bursts in and jumps Seth. Seth confesses to killing Tom and leaving Franco to die in the storage unit. Franco grabs him by the throat while Seth begs him to kill him because he deserves it. Franco lets Seth go, realizing he wants to be the better man. Dante and Nathan arrive. They arrest Seth. Dante needs a statement from both Liz an Franco, but Liz insists Franco return to the hospital. Anna (Finola Hughes) stops in to talk with Griffin (Matt Cohen). Sensing something is wrong, she quizzes him. He’s admits he’s having a hard time forgiving Valentin (James Patrick Stuart) for killing Claudette. Anna warns him not to make things worse by attacking him without proof, and she promises to get answers. She reveals what she knows about Valentin. She’s positive something happened at the Academy that turned him into monster. Franco’s in his hospital room, Kiki and Nathan come to visit. “Where’s Elizabeth?” Franco asks while Griffin checks him over. Once they leave he flashes to the trophies in the storage unit and wonders where he saw them before. He finally remembers seeing them at Tom’s house. “Liz is in danger!” he blurts out. Meanwhile, Griffin runs into Sam. He explains that Jason (Billy Miller) was checked in that morning. Sam goes to see Jason. He explains that Julian (Will deVry) drugged him to halt his investigation. He senses that Julian is afraid for her and Danny (T.K. Weaver). They wonder who the mysterious woman behind everything is, so they devise a plan to throw her off track and to figure out who she is. Sam goes to find out when is Julian coming in for physical therapy. They need to act quickly, so Jason makes a call. A short time later, Julian comes in for his appointment, Sonny (Maurice Benard) appears. Griffin lets Julian know that everything looks fine but they still have to wait for X-rays. Sam starts to question Julian about Jason being drugged, while Sonny approaches and wonders what’s going on. Sonny asks Griffin if he can wait in Jason’s room for the rest of the X-rays, because Jason hates hospitals. Griffin agrees. Sam & Sonny go to Jason room as planned. so Julian can listen in. They fake that Jason and Sam are out of investigating Morgan’s death. Julian falls for it. In his room, Franco remembers the trophies from the storage room were like ones at Seth Baker’s house. While planning his escape from the hospital an orderly takes him for an MRI. When he’s left in the wheelchair alone, Franco flees. Dante arrives while the orderly returns to find Franco has escaped, as Nathan meets up with Dante to also learn the same. Dante receives information on the storage unit where Franco was locked in. It turns out that it was Seth Baker’s unit. Later, Alexis drops by to see Franco, so Liz leaves to let them talk. She makes him aware that she owes him one for what he did for her. He says that they are both working on atonement. Meanwhile, at the nurse’s station, Sam is looking for Alexis. Liz informs her that she’s talking to Franco. Liz thanks her for finding Franco, while Sam feels they are even because Liz made her aware of the trouble Alexis was in. Later, Liz tells Franco he’s been released. She invites him over to her place, and he accepts. In the hallway, Sam meets up with Alexis and tells her that she and Danny are planning a trip out of town for a while, a vacation, and suggests that Alexis come with them. Alexis can’t because of her 12-step program. Later, Sam runs into Franco. She thanks him for not turning her mother in, but lets him know this doesn’t make up for what he did to her. Valentin and Nina (Michelle Stafford) start talking about Lulu’s embryos. He thinks they just need to reassure Charlotte about how much they love her. Valentin tells her the tale of Stavros and the eggs. Valentin didn’t want to participate but Helena sent Daphne to drug and seduce him. When he learned what happened, he stole the embryo. Nina’s impressed by his parental instincts. He turned to Claudette to be the surrogate and planned to tell his daughter everything when she was old enough. She thinks they need to start protecting their family. Anna interrupts and reminds him of what he said at the wedding, while it makes Nina uncomfortable. Lulu (Emme Rylan) and Valentin meet with one another to talk about Charlotte. She wants to make things easier for her. Lulu informs Valentin that’s she willing to share joint custody with one condition: that they all go to family counseling both sides. Once Valentin hears her offer he reneges on his agreement to share custody. Valentin talks with Nina about his past with Anna at the WSB. He tells her about his childhood and the severe form of Scoliosis he had that left him a hunchback, and the bullying he suffered as a result. he says Anna was the first to be his friend. He reveals he messed up by trying to kiss her, but she inspired him to get the surgeries he needed to get better. Nina calls Anna ugly inside for not seeing how incredible he is. He thanks her for not feeling pity or disgust for him. They decide to head home, but Nina says she needs to run a quick errand and leaves. Later, Carly (Laura Wright) meets Olivia (Lisa LoCicero) to warn her that Julian is involved in something bad, so Olivia should be careful for Leo’s sake. Carly switches topics to Ned’s invitation to stay at the mansion. Carly is excited that he might be wanting to marry Olivia. Olivia hopes that Carly is way off. She vents to Carly, saying that her track record with men isn’t good. She says that she and Leo are better off on their own. Nelle (Chloe Lanier) has the rattle is talking out loud. Michael (Chad Duell) shows up and asks her why she is sitting alone. She hides the rattle while dodging his question. She lets him know it’s the anniversay of her father’s death. Michael tells her that he understands, recalling his father, AJ’s, death. Her relationship with her father was complicated, but she remembers one good time, when they gazed up at the constellation, Orion. They talk about her relationship with the older man–its a relationship of convenience. They head to Sonny’s place so she can pick up the pictures for Josselyn’s family tree (Eden McCoy) project. At the bar, Felicia talks to Nelle regarding Maxie wedding, flowers are delivered for Nelle. Felicia thanks Nelle for keeping Maxie’s wedding on track, and thanks her with a “day at the spa” gift certificate. Felicia feigns being Nelle’s friend warns her about Bobbie. She tells her about her past with Bobbie. She offers to redecorate Nelle’s room for her. Michael and Joss arrive to thank Nelle for helping her with her project. Michael notices the flowers, and Nelle explains that they’re hers. When she walks off for something, Joss snoops to find out who sent the flowers, but the card only has the initial “S.” Nelle flashes back to ordering the flowers as she watches them. Nelle comes back, and they head to Sonny place to meet up with Carly. Later, Felicia (Kristina) and Bobbie (Jaclyn Zeman) meet up. Felicia explains that Nelle bought her act when Felicia pretended to warn her about Bobbie and offered to redecorate her apartment. She’s surprised that Nelle doesn’t have a social media life. They assume she must be there under a different name and wonder what she’s hiding. Ava (Maura West) tucks Avery in and then is confronted by Sonny about who is targeting her family. She doesn’t know who it could be if not him. Sonny asks about any long lost Jeromes that may want to take over, but Ava says she and brother are the last Jeromes. Sonny gets a call he has to take, and tells Ava she can go. Jason is on the phone and asks his old friend to visit him within the next half hour. Sam and Jason drop by to see him, Carly is there. They fill her in on the investigation before she leaves. Sam also departs to meet her mom. Once alone, Jason informs Sonny that he will find Morgan’s killer, but he’s going to deliver them to the police. Jason receives a call from Curtis, who tells Jason he’s ready to help him again if he still wants him. Some time later, Carly and Bobbie walk in while Sonny is being handcuffed. He informs them it’s because he has a doctor’s appointment. Carly and Bobbie go thru some family albums, they talk about her adding adopted parents pictures. She talks about how Frank Benson left her when she was three years old. Meanwhile, Nelle and Michael show up so Nelle can take the pictures to the printers. Michael notice a picture of Carly being held by someone. Carly tells her that’s her adopted father, Frank Benson. She doesn’t talk highly of him. Nelle asks if she ever check on them, she tell her she doesn’t give a damn what ever happen to Frank and lets her know what he did to her. Meanwhile, Nelle is visible upset with the way Carly speaks of Frank. Carly, Michael, and Bobbi go to search for more pictures. Nelle pictures an image of Carly being held by Carly with the rattle. She seems very upset, Bobbie walks in and notice that Nelle is upset while holding the picture and ask her what’s wrong? She says nothing. Carly & Michael come back while Bobbie questions Nelle. Nelle leaves. Later, Sonny sets things up so Sam can move in. Jason thanks him. They have no idea who is pulling Julian’s strings, but he understands Julian is their primary target. Curtis arrives and explains that Buzz has disappeared. Brick (Aaron D. Spears) is called in. He has a watch that can record conversations, but it will also pick up any surveillance equipment they encounter. After he and Curtis have a little tiff, they move on to the laser mic. Sonny shows Brick out and Curtis leaves with the equipment. Laura (Genie Francis) and Lulu (Emme Rylan) drop by hoping she has found something that Lulu can use against Valentin. Anna explains her connection to him in the past at the WSB, and how he was a genuinely a good man then. Anna and Laura both advise Lulu to meet Valentin halfway, which will give her time to build her case against him. Lulu claims that she just remembered something she needs to do and heads out. Laura warns Anna that Valentin is no longer that good man she once knew and to be careful. After Laura leaves, Nina arrives and asks Anna what she wants with her husband. Nina declares that Anna is obsessed with her husband, but Anna rebuts, no, it’s Valentin who is obsessed with her. Nina sees a picture of Valentin before his surgeries. Nina believe that Valentin really sees the true Anna, that Anna isn’t what she appears to be–she is ugly on the inside. Nina wants Anna to leave her husband alone! Ned (Wally Kurth) and Olivia get frisky on the couch when Dillon (Jason Palmer Watkins) walks in and ruins the moment. Olivia realizes she needs to go pick up Leo. Ned wishes she would consider moving in to the Q Mansion with Leo, but Olivia refuses. After she leaves, Ned opens up to Dillon about Olivia not wanting to move in. Dillon gets frank with his brother and counts down the list of his marriages, which are likely red flags to her. Ned realizes he can’t let Olivia get away, and starts thinking he should propose. Later, Joss is annoyed with Michael who won’t give her a photo of when he was ten. She starts teasing him about Nelle. Bobbie’s ears prick up. Joss asks if she can include pictures of Sabrina and the baby in her family tree and thinks she should put Nelle in too. Bobbie tells her to stop pushing him toward Nelle, because Nelle already has a boyfriend. Julian tells Alexis that he’s going to be moving back to Ava’s now that she’s sober. Alexis has to go out to see Sam, and she has some other things to do. So she leaves. Later as Julian is about to go, Olivia turns up at Alexis’ place. He orders her out, but she says she doesn’t take orders from him. She needs a status report on Jason. Julian explains that Jason has bowed out of the investigation to protect his family. She is pleased and asks what is going on with GH. Julian tells his sister that he’s been targeting members of the GH board, but Tracy (Jane Elliott) is pushing back. She warns him not to disappoint her. Suddenly Alexis walks in and finds them together. Olivia warns Julian not to disappoint her again. Alexis arrives, livid to see them there, as she knows Liv to be a random person she’s met in AA, taken a liking to, and asked to be her sponsor. She doesn’t want Julian in her business. Julian is shocked to learn Liv is putting on this elaborate charade. Alexis insists she likes and trusts her. She flashes back to their first meeting and how she babbled all her life details to Liv. When Alexis leaves to take a call, Julian and Liv bicker. After she departs, he encourages Alexis to lean on her children or him instead of some stranger. She looks at him in disbelief. After he leaves, Julian calls Liv and orders her to stay away from Alexis. Curtis follows after him as Alexis calls up Olivia, who assures her that she is her friend and ally. Liz makes Franco comfortable. He wonders if she can handle making their relationship official. She says she’s not afraid. He’s in love with her and wants to protect her. She admits she was conflicted about him but also admits she also loves him. She kisses his bruises. They undress each other & make love. Previous ArticleGeneral Hospital February Sweeps: The Future of Tracy Q. and GH!